View the full article on Style Blueprint. Native Magazine - "Up in the air"
In fact, making a giant balloon that reads “Time to veg out on some chicken wings” in hand-lettered calligraphy is just the kind of off-the-wall fun Sunny Becks and her [daughter], Fiona Flaherty, do best. Style blueprint - "This Mother-Daughter Duo is Blowing Nashville Away With Their Balloons!" “We delivered balloons to a girl who was turning 2. When she saw the jumbo balloons, she grabbed her chest and sighed. That is how balloons make people feel. The guy in the suit who gets a dinosaur balloon at work is just as excited,” Sunny Becks of Harlan Ruby tells us. 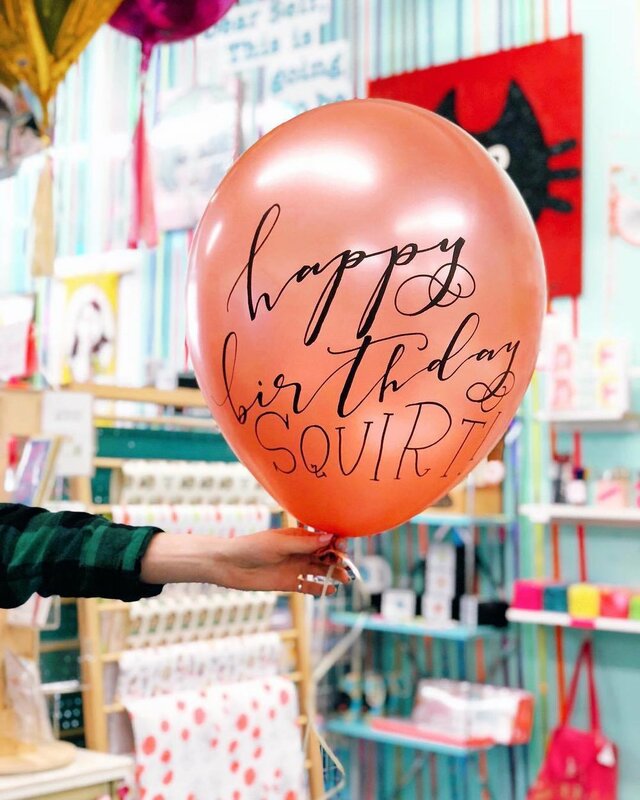 In partnership with her daughter Fiona Flaherty, Sunny runs Harlan Ruby, a gift and party shop — complete with balloon bar — in East Nashville. Six years ago, Sunny opened the space to expand her hula hoop business. Fiona, a recent Parsons School of Design graduate, returned home and helped develop the space into a curated gift shop. In March of last year, Sunny and Fiona blew up their first balloon, and they haven’t stopped blowing up balloons since. “We didn’t invent the wheel, but we found extreme inspiration and happiness going after the creative process with balloons. We just kind of dove in,” Sunny says of expanding their business and launching Vroom Vroom Balloon, bespoke balloon styling. In December, a balloon installation brought color to Proper Bagel, a black-and-white bagel shop on Belmont Boulevard. “Proper Bagel put us on the map,” Sunny shares. “The installation was only up for 24 hours, so a lot of people saw photos but few saw it in person.” The next grand opportunity for folks to see a work of balloon art was a Valentine’s Day installation on the exterior of Café Roze. Although those are two of the larger installations, we also spotted balloons at NFA Honors, Noelle, a New Year’s Eve event with 12th Table, Gus Mayer‘s Jason Wu pop-up and atop Amelia’s Flower Truck.